The ‘European Clinical Specialization in Fluency Disorders' is a groundbreaking initiative in the field of fluency disorders. 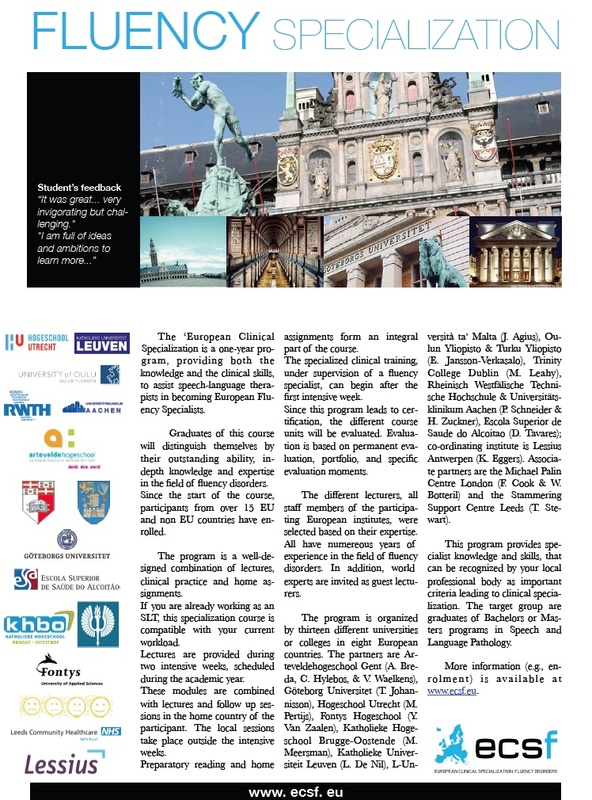 The ‘ECSF' is a one-year program - compatible with the workload of an SLT - for speech-language therapists wanting to become European Fluency Specialists.The program is run by a consortium consisting of 10 partners (universities and colleges) and 5 associate partners from 9 European countries. Currently almost 200 students from 27 EU and non-EU countries have graduated and the program will start its eleventh course cycle in September 2018. Graduates of this course distinguish themselves by their outstanding ability, in-depth knowledge and expertise in the field of fluency disorders. This program provides specialist knowledge and skills that can be recognized by your local professional body as important criteria leading to clinical specialization. To receive the latest news in your mailbox. One week is left to the 6th European Symposium in Fluency Disorders which will take place in Antwerp on the 16th and 17th of February 2018. A pre-symosium workshop will take place on the 16th of February. The theme of the workshop is "A Constructivist Framework for Counseling with Persons Who Stutter" presented by Anthony DiLollo, PhD. The ECSF consortium has now taken a next step to ensure that patients receive the highest possible standard of care in the EU: the development of an additional stepwise procedure to become a European Fluency Specialist. The first intensive week of the course cycle 1516 and the postgraduate workshop took place in Malta from September 21 to 25th. High interest in ECSF course. Because of the high number of application forms that were received, the ECSF consortium decided to increase the amount of students per course cycle from 20 to 24. This will be evaluated after one year. The ECSF consortium is organizing the third annual workshop for ECSF graduates. This is not only an ideal occasion to meet up with some of your classmates or to interact with fluency specialists from the previous 7 course cycles, it is also an opportunity to upgrade your clinical knowledge. This year's workshop focuses on 4 topics: The Art of coaching by Anne Breda (Wednesday), Solution Focused Brief Treatment and The Artists Eye by Trudy Stewart (Thursday and Friday) and Clinical Intervision by Anne Breda & Veerle Waelkens (Saturday morning).The workshop will take place in Malta, in parallel with the first intensive week of the specialization program. At the general meeting in Portugal steering committee decided to upgrade the ECSF Course from 20 credits to 25 credits. Last year we asked our students how much time they invested in the course, the outcome was a lot of more hours, so the course received more credits. The final report of the mini symposium in Leeds, a joint initiative of the Stammering Support Center and ECSF, is now available. ECSF and Stammering Support Center Leeds organized a mini symposium in Leeds for people who stammer, clinicians, and researchers. The ECSF consortium is organizing the first annual workshop for ECSF graduates. This is not only an ideal occasion to meet up with some of your classmates or to interact with fluency specialists from the previous 5 course cycles, it is also an opportunity to upgrade your clinical knowledge. This year's workshop focuses on 2 topics: Cluttering and Clinical Intervision. The workshop will take place in Portugal, in parallel with the first intensive week of the specialization program. Interested in applying for the specialization course? Click here. The 1819 course cycle is fully booked. Feedback of the EU commission, participants, and ASHA fluency specialists. 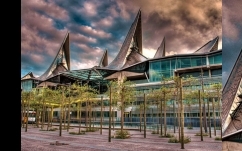 The biennial European Symposium on Fluency Disorders is an initiative of the ECSF-consortium and focuses on causal and contributing factors as well as on intervention related topics.